Ontario is Canada’s second largest province by area, holding the biggest population. 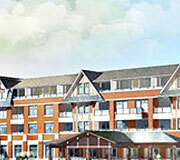 The province has a wide variety of Ontario retirement homes located in communities large and small. The major cities offer senior residents a wide variety of activities such as exciting sporting events, luxury and affordable shopping, fine dining, and more. Meanwhile the smaller cities, often still within travelling distance to the larger cities, provide a more peaceful atmosphere. If you are looking for a list of Ontario retirement homes for your loved ones to choose from, there are many great places to consider. Greater Toronto Area: The GTA allows residents to enjoy the social life of the city, convenient transportation, and many opportunities to attend events, outings, or even to volunteer. Residents can easily keep in touch with their family members and friends, and enjoy the tourist attractions of the city with great ease. Niagara: The Niagara region is one of the most beautiful areas of the province. Retirement communities in this area provide comfort and security with features like motion-triggered washroom lights, lever handles, and two-way emergency call systems. Since this is also a tourist area, there are many beautiful sites to see such as the gorgeous Niagara Falls, as well as luxury spas, museums, and even the casino, to entertain senior residents. Northern, Central, Eastern, and Southern Ontario: The surrounding areas of the province provide incredible sights to see, and high-quality services for seniors. Whether you want a community that has access to golf courses, fitness centres, medical facilities, a vibrant outdoor lifestyle, a supportive social environment, or accessibility convenience, there is a place for every kind of person.